Breathe new life into your home by having your floors refinished! Refinishing includes sanding down and coating the flooring rather than simply recoating, which is advisable to do between full refinishing jobs. Having this done will take dingy, worn out wood floors and transform them into gleaming, beautiful surfaces that will elicit compliments for years to come. It is a less expensive alternative to replacing them, and they will still look brand new! Refinishing your floor can give your home a whole new look and feel depending on the color and finish you choose, and it will hold up for a long time. Not to mention that a clean, cared for floor will add value to your home, so refinishing is a good idea if you are looking to sell. No matter what your reason, we are happy to help you in the refinishing process. How often should you refinish your floors? This will vary, depending on wear and tear, but generally every 10 years is a good time frame. Of course you can have a refinishing done less often if you have them recoated every few years - about 5. Of course these times are just general! You'll likely be able to tell when it's time to call the pros to come look - while some scratches are normal and not a problem, an excessive amount of scratches or deep gauges that have penetrating the stain/coating are a sign that it's time to have the job done. No matter how scratched or worn, it's likely refinishing will correct the problem and it's certainly a more affordable option than having all new flooring installed. After all is said and done, you'll want to protect your floors! There's several ways to keep them looking new for years to come. For the first week, while the finish is still curing, minimize activity on the floor and when it comes to cleaning simply use a dry dust mop. Moving forward, keeping them clean is the first step, and cleaning them properly. Vacuums have the potential to scratch and damage your floors if you use the wrong setting or attachment, so sweeping is preferable. Avoid using soap and water for mopping in favor of solutions safe the finish/seal and stick to damp mopping rather than saturating the floor. Another cleaner to avoid is vinegar - many people use vinegar as an all purpose cleaner but the acidity will damage and likely strip the sealant. There are several types of cleaners available, many safe for floors and finishes, but some can strip the finish if used too often or if they're simply too harsh, so be mindful of which product you choose. You should also avoid abrasive cleaning tools. Yes, cleaning is important and it will preserve your floors greatly if done correctly. Area rugs and runners are another way to protect your walking surfaces - they're especially a good idea for the high traffic ares of your home. Here we've compiled some of the best companies in around several major cities across the country. This is definitely a task you should not DIY. Having it done properly requires skill and proper equipment. The pros having plenty of experience and equipment that is vastly superior to anything you can rent to DIY. It's a tough task and you'll be much happier with the results of professionals, not to mention they'll be able to work much quicker. Wherever you're located, if you're ready to have your flooring refinished and restored to like-new quality, call any of the companies suggested throughout our site and you'll be in good hands! 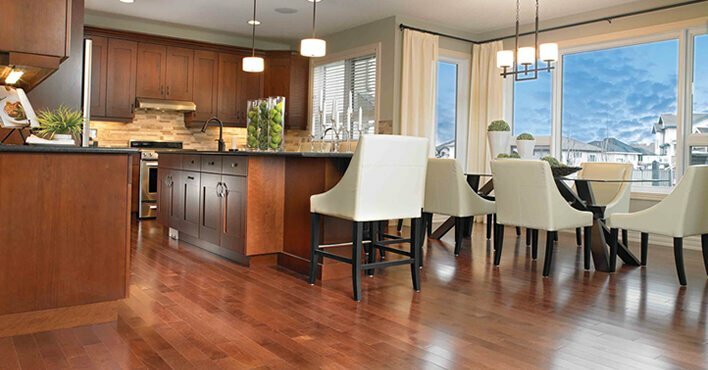 Solid hardwood is milled from solid lumber and works well in almost any room. This type of wood flooring will last for years to come and can be sanded and refinished numerous times to maintain its natural beauty. Engineered wood flooring combines a thin-but-tough real hardwood surface with underlying multiple layers of plywood or fireboard. Its laminated layers make it remarkably strong and more resistant to moisture. As a result, it can be used in below, on, or above grade locations, basements. The species of wood you choose will depend largely on the style of your room and personal preference. Oak, hard maple and birch are common in most homes, but all wood species are suitable for everyday use. Ultimately, you should try to choose your wood flooring by its look and appearance. Alternative flooring options are becoming more and more popular. There are several options that are eco-friendly, renewable, and sustainable, one of which is bamboo! Bamboo floors are beautiful, but it does require special care. Refinishing bamboo is a delicate process that should be left to the pros. Copyrights © 2018 | www.refinishes.com | All Rights Reserved.